Note: This guide has been updated as of 2014-09-22 for MediaWiki v1.23. If you’re using this version (or later) please see the Infoboxes in MediaWiki v1.23 post. 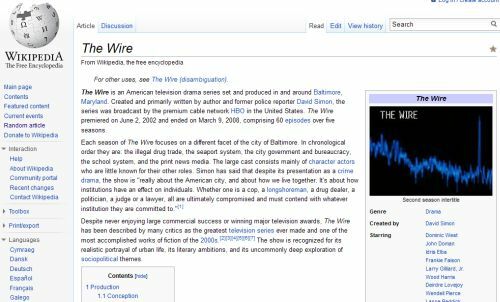 If you’ve ever been to any of the more structured Wikipedia pages you probably have seen the neat “infoboxes” that they have on the right hand side. They’re a neat, convenient way to get some of the core metainfo from an article. If you have your own MediaWiki instance, you’ve probably thought they’d be a nice thing to have, so maybe you copy and pasted the code from Wikipedia and then were surprised when it didn’t just magically work. Turns out that the infobox stuff is part of MediaWiki’s extensive Templating system, so first of all you need the templates. Sounds easy, right? Well, no. You don’t just flip a switch or download a file, and when you do a search you might find this article which details a process that it says might take 60-90 minutes. I started looking into it and quickly got lost; you basically need to create a billion different Templates and do all sorts of weird stuff to get it to work. Fortunately I stumbled across this discussion which contained a clue that greatly simplifies the process. I was able to distill the steps down to a process that I was able to reproduce on a new MediaWiki install in about five minutes. Before we start, I’ll throw in the warning that I have not read the documentation and I don’t understand at a low level what is happening with the templating. I just wanted a working, simple infobox. Download the MediaWiki extension ParserFunctions and add it to your LocalSettings.php as referred to there. In the big text area field, just put in “Template:Infobox”. Hit the ‘Export’ button; it will think for a second then spit out an XML file containing all the Wikipedia Templates for the infobox for you to save to your PC. Now you have the Template, you need to integrate them into your MediaWiki instance. Simply go to your Import page – http://your_wiki/wiki/index.php/Special:Import – select the file and then hit ‘Upload file’. NOTE: see update at the bottom of the page before doing this. The full infobox Template docs are available here – there’s a lot of stuff in there, but if you just want a really basic infobox then this is the simplest way I found to get them working. I tested this on two separate MediaWiki installs – one running v1.12.1 and one on v1.15.1 – and it worked on both of them, but as always YMMV. Install the Scribunto extension and add it to your LocalSettings.php as usual. It looks like this extension is now required for the InfoBox templates (in fact, it looks like it replaces ParserFunctions entirely, but I’m still testing that). The XML file that is output in step 3 appears to erroneously (?) use text/plain as the format type. If you edit this XML file in your text editor and replace all incidents of ‘text/plain’ with ‘CONTENT_FORMAT_TEXT’ (I only found two), the import will be successful and the infobox tags looks like they work. If someone else can confirm this for me as a working solution I’ll revise the original post so it takes these steps into account. Not sure what to do now, i’m looking for binary suitable for an ARM processor. But the Scribunto page says that only Lua 5.1.x is supported and that looks pretty old. The revised steps work perfectly for me (although, three incidents of text/plain in the exported XML, guess Wikipedia’s been busy) using a freshly-installed, self-hosted Mediawiki on Linux. Does anyone have a version they would like to share that is working with templates et all. I cannot seem to get the 1.21.2 version working with scribunto; so ergo no templates. Sorry, I forgot to say in my previous post ‘thankyou’ to for putting this tutorial up and keeping it up to date! Much appreciated. Thanks for the tutorial. I ran into that error Zee mentioned, but I found a website that described a fix. “Fatal exception of type ScribuntoException” FIXED! If the Linux version is 64 bits, change the lua file in the 64 bit folder inside the same binaries folder as the 32 bit file. The problem with Scribunto you will fix if you just download the LATEST (“not stable”) version of Scribunto. Thanks for this tutorial. I was able to get a mobile instance of xampp up and running with Infoboxes! Like Chris I had 3 cases of text/plain to replace. When I uploaded the first time it took a long time so I stopped the upload and checked any recent changes. I restarted the server and uploaded again and bingo, infobox capability was there. Thanks again. That said, I’m completely stuck. I’m on the newest MediaWiki 1.21.2, the newest ParserFunctions 1.5.1, the newest Scribunto, I’ve followed all the instructions–starting with the main tutorial, as updated. Like others, I get three text/plain replacements when I edit the Template:Infobox and Template:Infobox/doc export xml. I’ve changed ALL the lua executable permissions to 755. Also, I learned that if you repeat the import multiple times–even though you’re importing the exact same file–eventually some of the errors go away. As though something in the import is dependent on something else in the import. I’ve spent way too many hours on this (so what else is new :-) … anyone have any idea what might be going on? Do I really need HTMLTidy? Do a thousand import attempts mess things up so badly that I should just rebuild the whole wiki from scratch and start clean? Any suggestions? Thanks! In the future, if you come across a problem like this, please file a bug. Please add any details that I missed. Just confirming that the new way works. Confirmed that this work in MediaWiki 1.23a with GoMediaWiki free skins. Receiving the following error. Any ideas? Lua error in package.lua at line 80: module `Module:HtmlBuilder’ not found. We’re running almost stock MediaWiki on Windows 7 and Apache. Your updated instructions worked perfectly! Thank you. We ran into an issue of, when we were trying this ourselves we had already created the Template:Infobox page. When you import it doesn’t automatically overwrite what we already had. We had to delete our existing page (logged in as sysops) and then it imported perfectly. Thank you so much for this easy to follow guide! I did encounter one hiccup though… I initially got a ‘Script Error’ that read ‘Lua error: Internal error: Unable to decode message.’ To fix this, I simply had to download the latest master version of Scribunto (I had previously installed the 1.21 version as I’m running MW 1.21.2) – now it works. It appears that you can no longer export the info box template. Lua error: Internal error: The interpreter has terminated with signal "11". I’m having trouble getting Scribunto & Lua to work. * I have the latest Scibunto extension that includes Lua.and binaries. * All Lua executables and paths are 0755. The lua binary (/…wikipath…/extensions/Scribunto/engines/LuaStandalone/binaries/lua5_1_5_linux_32_generic/lua) is not executable. How can I get the others . Thanks a whole lot, your 2013-07-27update definitely worked for me. The Infobox looks so cool I’m so thankful. I’ve run across many of the issues mentioned in the above comments, and have managed to fix many problems, BUT I still get Script error on all of my templates and on many of my modules. Lua error in Module:Message_box at line 20: attempt to index field ‘text’ (a nil value). I can’t help but feel that overcoming that error will involve solving my last big problem. Anyone else run into this problem? I had problems with uploading the XML file. Every uploading attempts ended up with a blank page. After enabling PHP debug function of the MediaWiki engine, I found the “Call to undefined function mb_check_encoding() in …/extensions/Scribunto/engines/LuaCommon/UstringLibrary.php” error message after I tried to upload the XML file. Now I have infoboxes working. It seems to work but when I click on a template, I always have script error “Error Lua in mw.html.lua in line 345: Tag name must be a string. I push the common.css, the Scribunto and Parserfunctions extensions. This absolutely does not work. I followed this guide to the last detail, step by step, no mistakes. First I got a lua error. Added the codes to my LocalSettings.php file as recommended from the Scribunto extension page and my entire wiki went down. Sighted a fatal error with the lines the chmod and chcon codes are on. Removed those only to find none of the templates import correctly. All have script errors and are not working. Tried to import them again. No change. Looks like this post has been pretty much abandoned. So, this is for any new reader such as myself who was hoping to find an easy solution to get a simple stupid box working on your page. This does NOT work. I actually tested it again about a month ago and it worked fine (I updated the blog post with some minor edits, I think). Can you provide some more information about what you’re working on? e.g., are you using MediaWiki from source or from package? What versions of the extensions did you use? I’m using 1.24.1 MediaWiki via a one-click install from Dreamhost. So I assume that means it was a package, but not 100% sure. I’m using the extensions from the direct links you provided. I followed this guide down to the last detail and did everything it advised to do. This used to work!, Now with MW 1.25.2 an import generates a server 500 error after a few minutes. Lua error in mw.html.lua at line 253: Invalid class given: The name must be either a string or a number. Are you able to make heads or tails of this, and what may be going on? In place of my infobox I get a red Script error. Thanks for any clarification Trog. It’s been a while since I tested this so it’s quite possible the guide is now out of date due to version changes in some of the dependent libraries. I’ll try and have another crack to see what I can find but not sure when I’ll have a chance, sorry! No problem Trog! I’ll check in from day to day to see if you have gotten to it. Thanks for your time and consideration! I simply loaded Scribunto for mw ver 1.24. for my 1.23 instance, this gave me the latest functional version for 1.23, and the info box works now. I have not tried Scribunto for mw 1.26, it may work as well. @trog – I have not read all the comments and I realize this article is old, but I can confirm that, by integrating the last step discussed in the article before importing the template XML, it works flawlessly in MediaWiki 1.26. The XML file had more like 20 instances of ‘text/plain’ when I looked. It’s quite possible it has changed a lot since I wrote this originally! XML now at 22 instances. Worked fine for just the templates, but I also needed to change the file permissions for extensions/Scribunto/includes/engines/LuaStandalone/binaries/lua5_1_5_linux_64_generic/lua to allow it to execute during the import the modules. Previous Previous post: WackGet v1.2.4 – Now Works on Windows 7 (and Vista)!